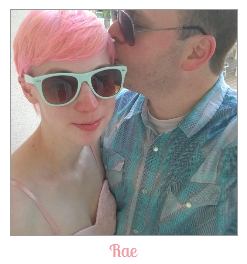 A few weeks ago I wrote a blog post on our house hunting adventures. You can visit that post by clicking here. 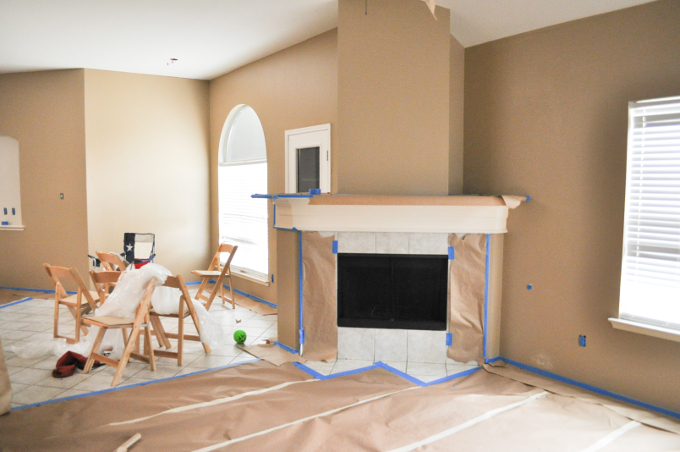 This blog post (part two) will cover the cosmetic renovation of our new home! 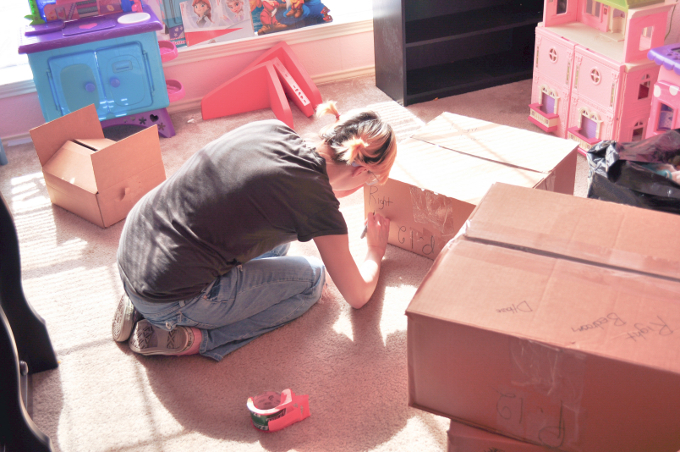 When we closed on the house, we had another month in the apartment before our contract ended. We were very thankful for that. Because even though we absolutely loved the house, we knew we were in for a pretty big (we had no idea) cosmetic renovation and we didn’t want to try living in our new house while it was going on. Very glad we didn’t have to do that! We started by cleaning the house. Bathrooms first, of course. I’m pretty proud of myself for remembering to bring toilet paper, ahem. But I can honestly say that we cleaned this house from top to bottom. Every baseboard, doorframe, cabinet, closet, etc. And that’s mainly because we knew the painter’s tape wouldn’t stick if any of that was dusty. Plus everything just needed a good cleaning. It took MUCH longer than I thought it would, but at least I can say I know every nook and cranny of this house. 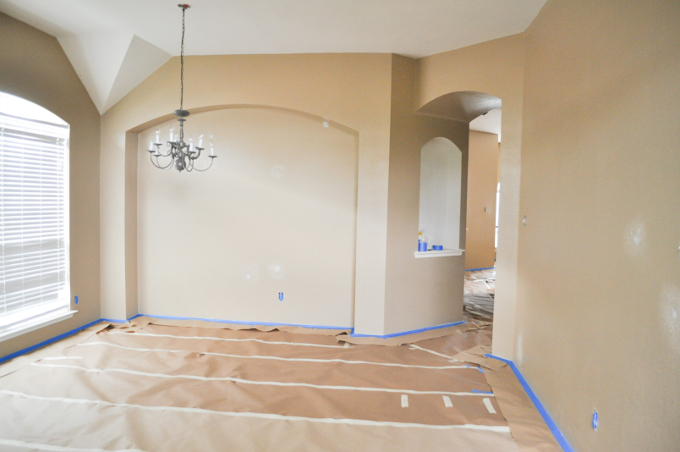 We first had to spackle and sand the walls where spots weren’t patched correctly. And then we started taping everything off. I taped off the doorframes and Jeremy taped off the baseboards. 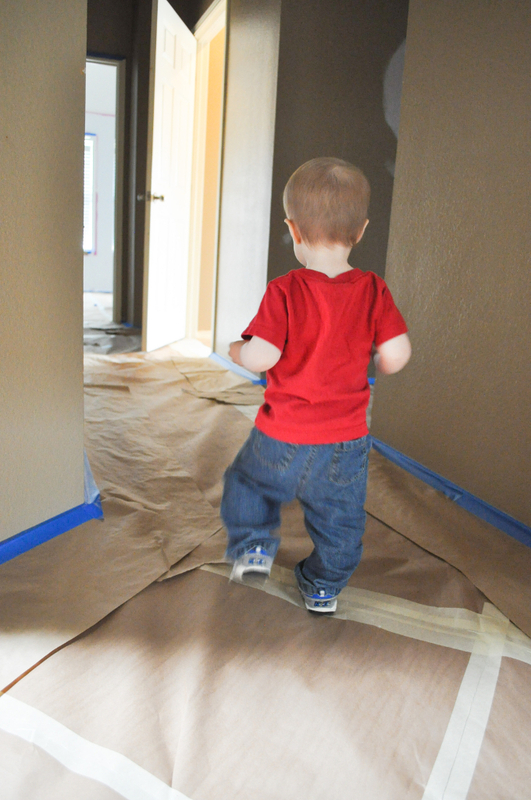 He decided to cover all of the carpet in brown paper and tape off the baseboards along with it. 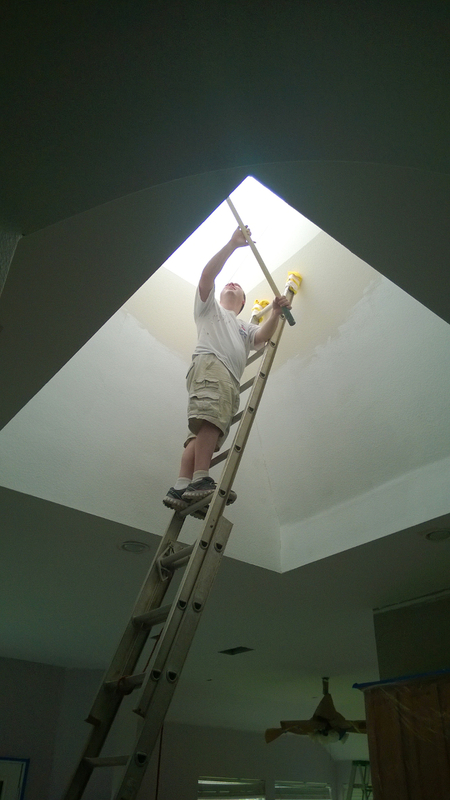 It was really the best decision since we ended up having to paint the ceilings too. Not that we really LIKED the carpet. It wasn’t like, “oh no. Save the carpet!” We really kind of hate the carpet. But, you know, the less paint splattered around the better. 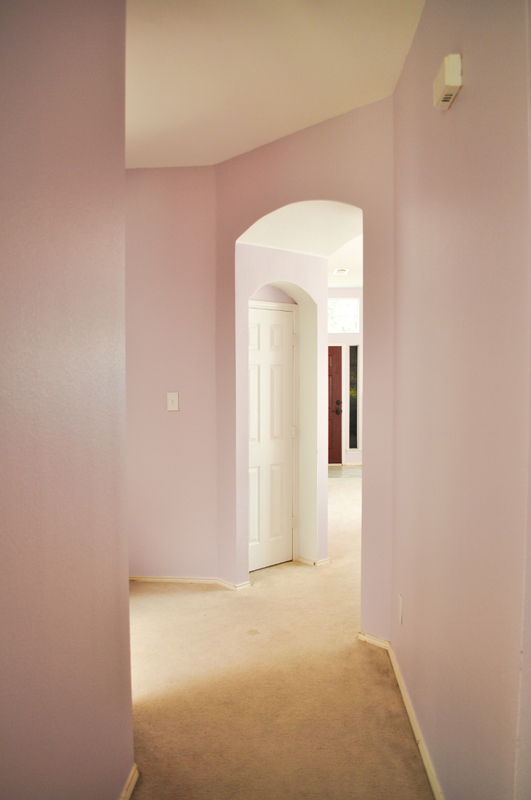 Luckily we had already chosen our paint colors before closing on the house. So that was one less thing to do! I was so excited to finally see our colors on the walls. 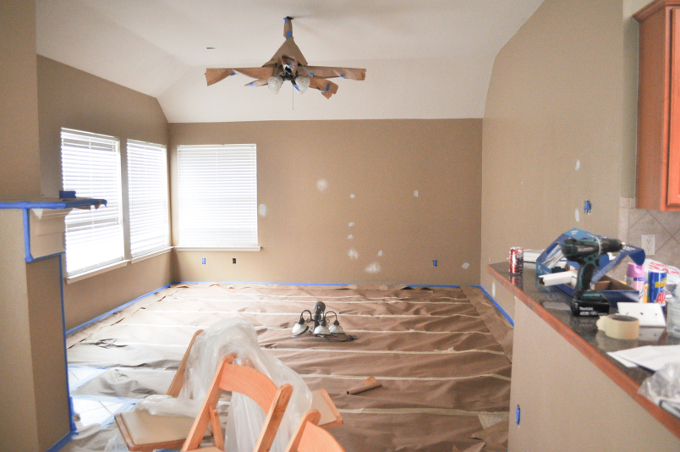 Unfortunately the browns in the house were so dark that it took two coats of paint on ALL of the walls to cover it all up. We had a paint party with some family members. And other family members watched the kids, thank God. 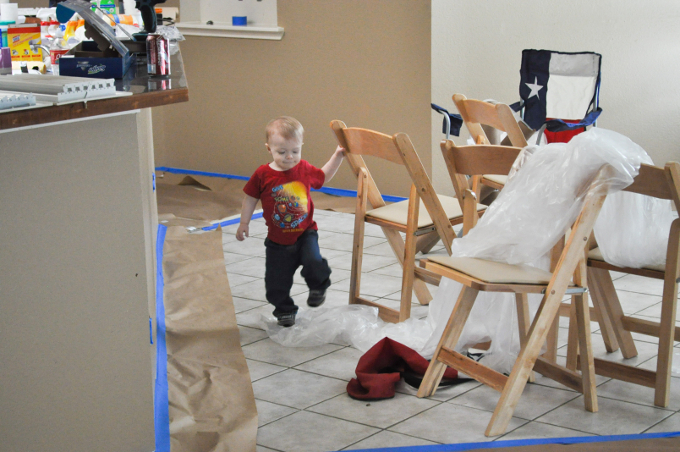 Can you imagine trying to paint with a 4 year old and an almost 2 year old running around? Now, if I’ve learned anything from watching Property Brothers, it’s that something unexpected will come up with every renovation project. 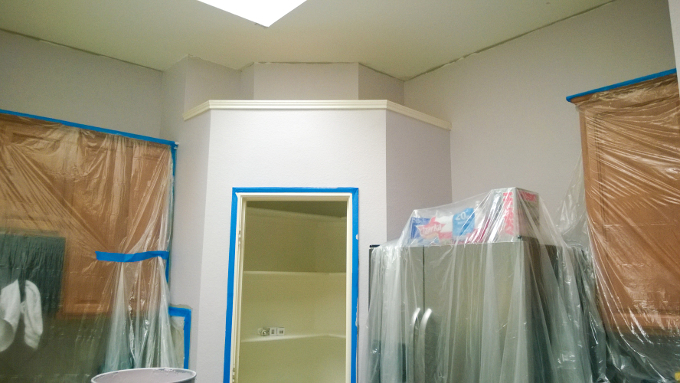 Not even our little cosmetic renovation escaped that rule of thumb. 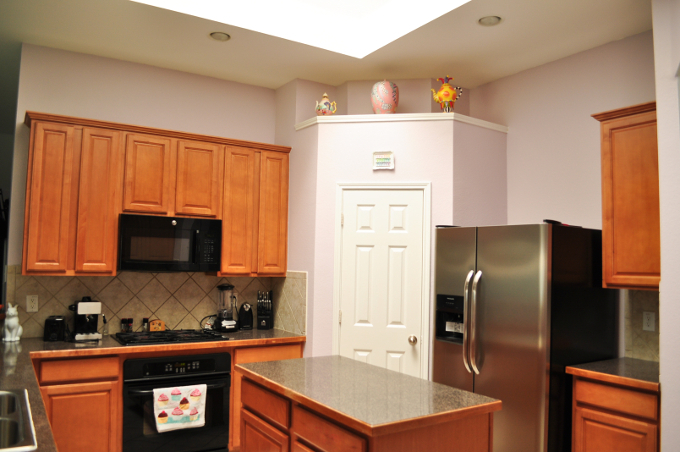 Our intention was to refresh the paint on the ceilings. Unfortunately, we found out pretty quickly that the ceilings were NOT white like we thought. They were brown. Yes, more brown. So not only did we have to do two coats of paint on every wall. 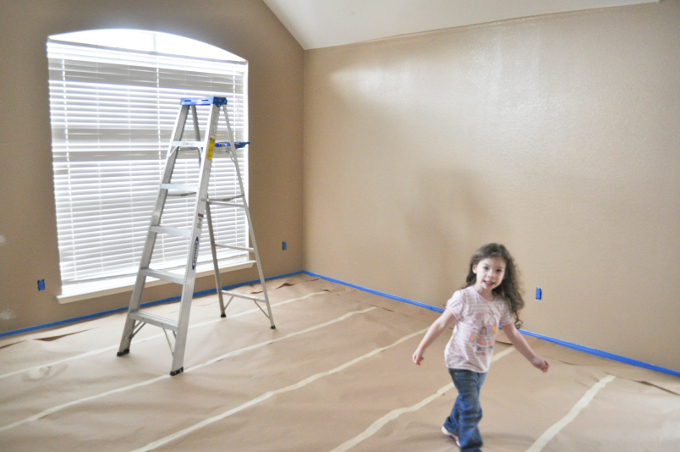 We also had to do two coats of paint on every single ceiling in the house! Once again, thank God for family members who were willing to spend time and energy helping us. The doors in the house were another issue. Some were white, some were brown, and some had been drawn on with a marker. 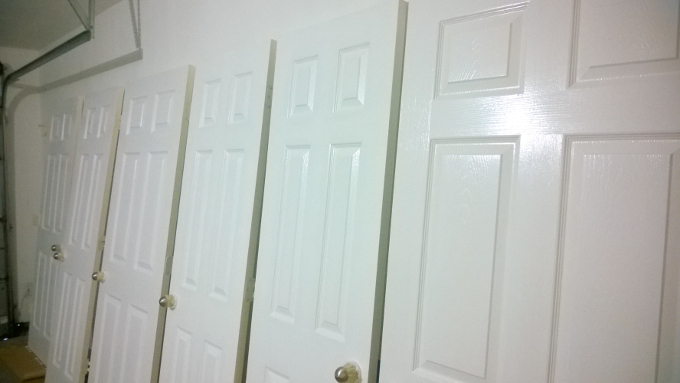 I really wanted everything to be white, so we contemplated just buying new doors. But that really wasn’t in our budget. We had taken all of the doors out to the garage so they wouldn’t be in the way while we painted. 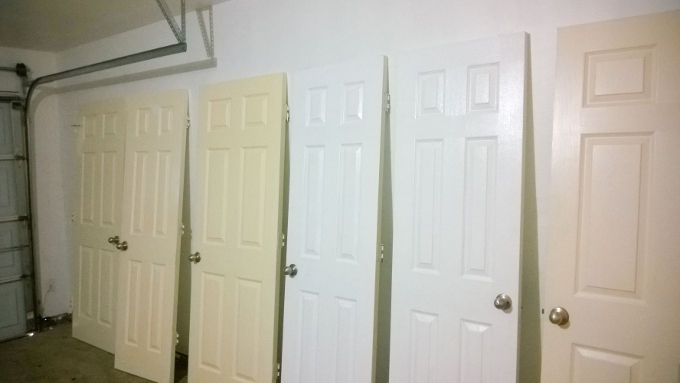 So while the doors were sitting in the garage, we tackled the task of painting them all. Twenty doors. Front and back. Another task that took MUCH longer than I thought. By the end of it I was definitely questioning why I had decided that door color was so important. But I don’t regret painting them. Especially after seeing these before and after pictures. Jeremy tackled the skylight in the kitchen while I was painting the doors. And the doorframes! Ah, yes. More brown. I really wanted to paint these anyway because they were chipped to high heaven. Another huge, what-have-I-gotten-into task. 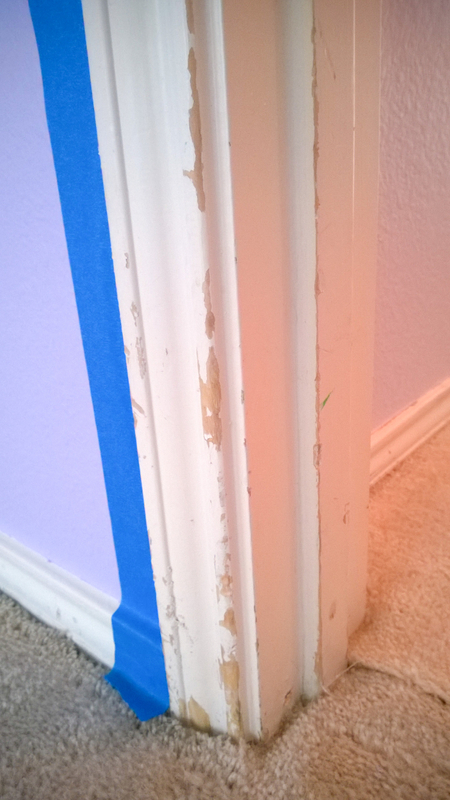 I mean, it’s very hard to paint doorframes without hitting the carpet. But just look at the difference! 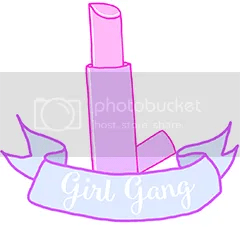 This is in Shade’s room with her new wall color. 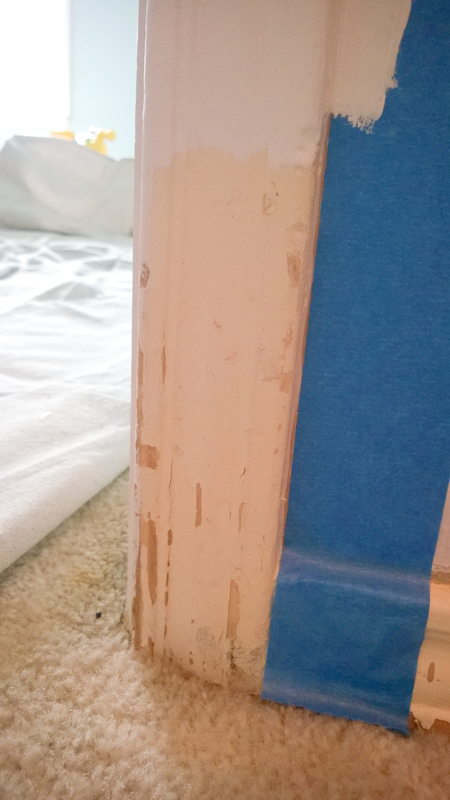 The baseboards of the house were just as bad as the doorframes. And it took everything in me to not start working on those. 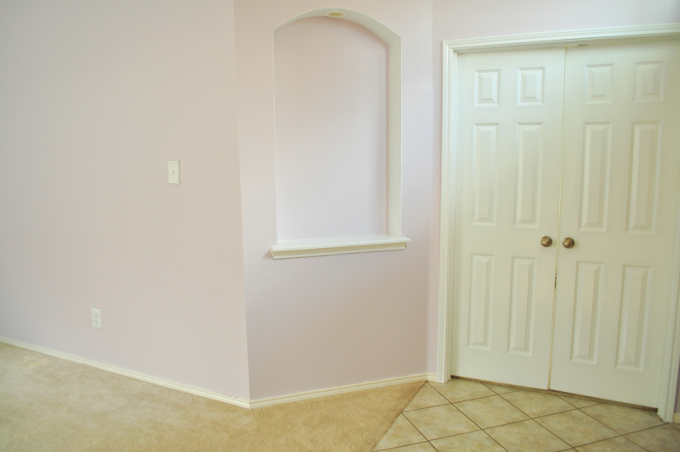 But we ran out of time and painting the baseboards would’ve been an impossibly HUGE job. Luckily most of the furniture covers the baseboards. So they’re not completely obvious, but they still bother me. 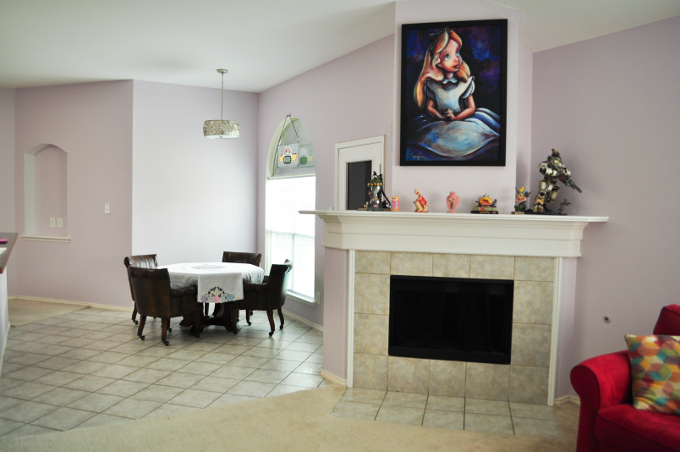 Jeremy also re-painted the trim in the kitchen and around the kid’s windows, the window sills, and the fireplace mantle. They look SO much better. It took the full month to get the house painted. 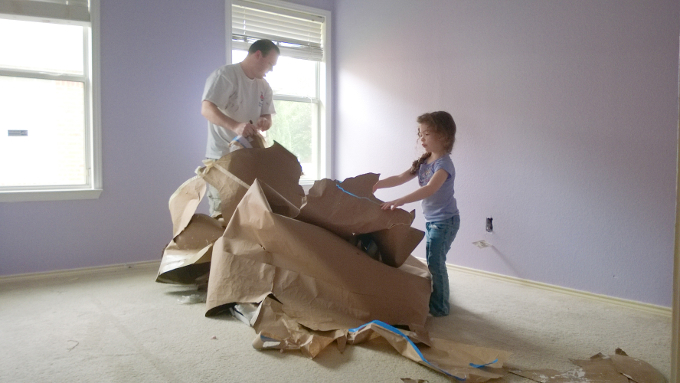 And when all the painting was complete, we had the kids come over to help pull up the brown paper. They were so excited. We all were, because it meant that we were DONE with painting and very close to moving in. So, here’s the finished product! 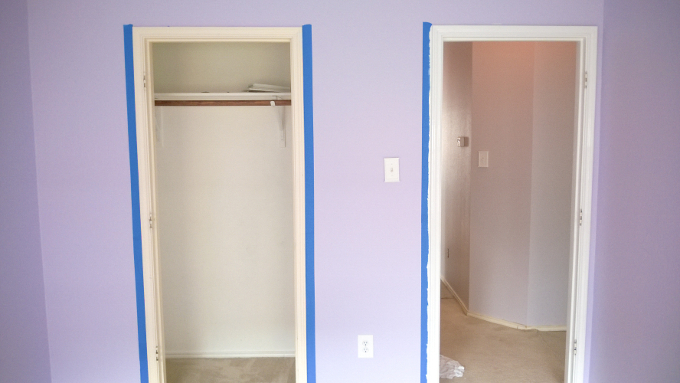 I think we made awesome choices in paint colors. 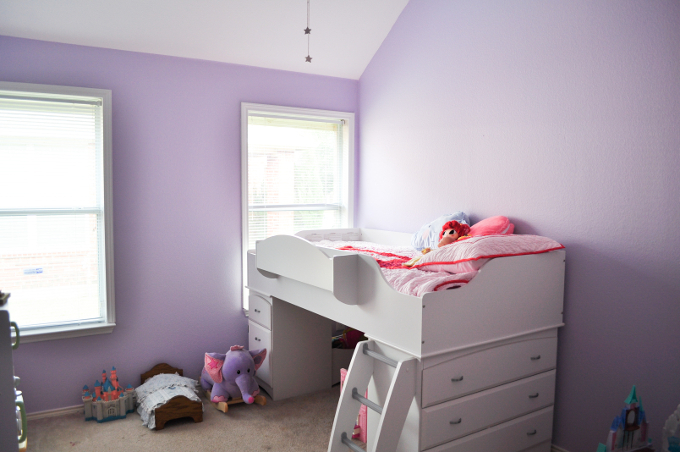 Shade wanted purple for her room. 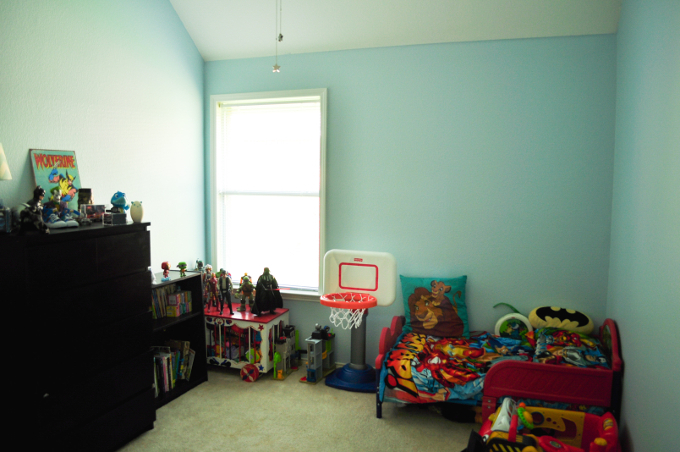 We chose a light blue for Atlas’ room. 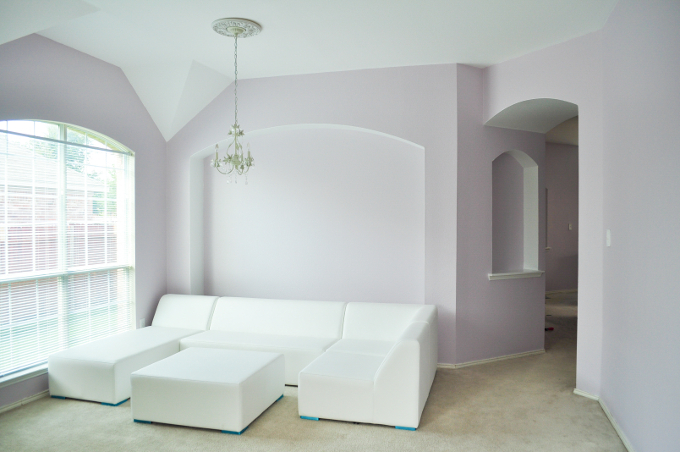 And we chose a pretty unique color for the rest of the house. 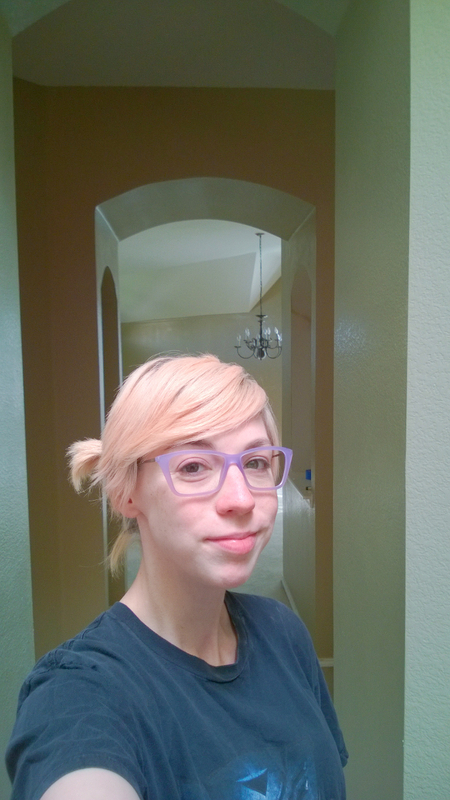 It’s a shade of purple, but sometimes it looks pink and other times it looks gray. It just depends on the time of day/the way the light hits it. I totally love it. There are some other things we plan to change in the house. I would really love to have white cabinets in the kitchen. And the flooring! 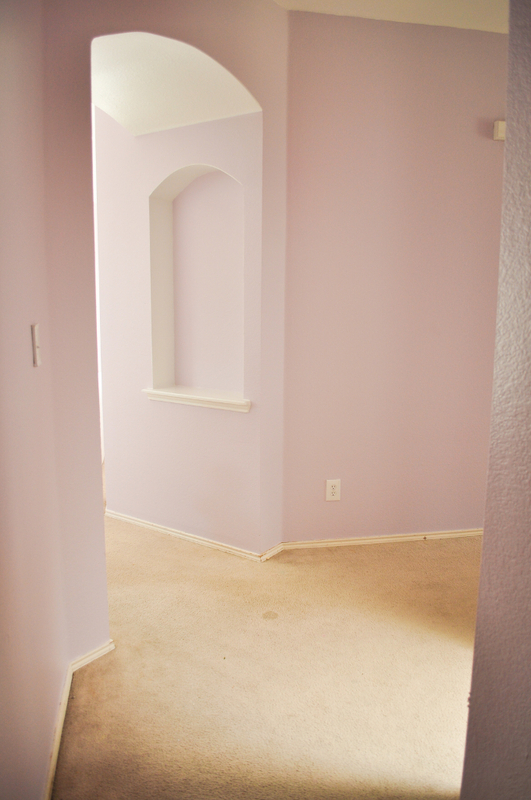 We’re planning on getting hardwood floors and brand new baseboards. But this time around we’re definitely going to hire someone to do all of that! Overall we’re really proud of how our house turned out. It was tiring and stressful, but definitely worth it! 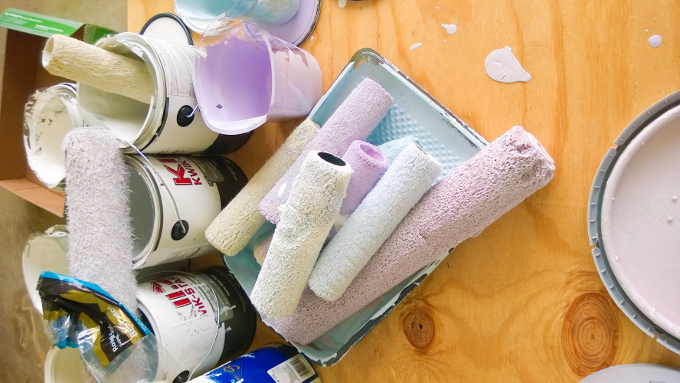 If you guys have any home renovation stories, feel free to share! I’d love to hear them. Did everything work out the way you planned? Your house is beautiful! I love the chairs at the table.